A daytime poké peddler on Kingly Street. Weekday lunchtimes are a terrible trial, the burden of choice weighing heavy as the cross. On the one hand, all anyone really wants is a fat sandwich, but who’s got time for the afternoon carb lull? (And the pervading guilt – these are the dark days of clean eating after all.) A salad? Too worthy. Sushi? Good Lord! Too meagre unless you’ve an expense account. Enter Island Poké, a Kingly Street spot hawking a speedy take on the increasingly ubiquitous raw fish salad bowls, Hawaiian in origin and here bastardised with Japanese and Californian embellishments. The tiny shop’s interior has a heavy South Pacific vibe, all pale wood and stock photos of beach scenes, with concessions to hipster nonsense in the form of swing seats in the window and profane R&B on the stereo. It’s all very serene. The ‘concept’ replicates your average burrito-style conveyor-belt building system. Choose a base (brown or sushi rice, or salad), a fish, and then a host of toppings, dressings, sprinkles and so on until you’ve got a sizeable mound of food, crucially occupying the middle ground between Instagrammable delicateness and sriracha-splattered taste explosion. There are a few standard house combinations. I went for a classic ‘ahi’ bowl, and very good it was too: decent sushi rice topped with marinated tuna shoyu, zingy pineapple chilli salsa and shredded wakame seaweed, embellished with nori and crispy shallots. A piquant dressing of Japanese seven spice, soy and ginger gives pungent high notes, while a liberal drizzle of sriracha mayo whacks you round the chops with soothing, spicy umami. It was excellent stuff and, for south of £8, brilliant value (my companion’s rather cleaner bowl of brown rice, tuna, edamame, ginger and sesame was equally good). Go on, give Pret a poké in the eye. Poke. In my mind, it's sushi's older, hipper and much more comfortable-in-its-own-skin sibling. Whereas I often find sushi can leave my tummy rumbling and my palate salt-baked, a bowl of good poke is filling, tasty & full of flavours and textures that work well together...enter stage right Island Poke. Sat in the heart of Soho, this place has been on my list for a while and now that I've been, it'll be on that list again. And again. And again. The vibe is modern but with a charming hint of Hawaiian quirk and while I found the staff to be polite rather than friendly, prompt service and a generous portion both came my way so no complaints here. There are set dishes on offer plus a rotating guest menu but like the adventure books of my childhood, I sure do love me a create-your-own. Go super healthy with greens or more traditional with sushi rice, add plump chunks of blushing salmon or near-translucent tuna and then go crazy with fresh, crunchy, flavourful toppings and fragrant dressings. I can highly recommend the edamame, the seaweed, the chilli pineapple and the crack-addictive crispy onions and you'll get change from your tenner for a bulging bowl and a drink. Grab a stool in the small window & wall seating area and dig into lunch that's a million times more satisfying and delicious than *THAT* chain again. I have been to both Kingly Street and Broadgate Circle now, and this place gets 5/5 in my opinion. Its not just the delicious food at fair value prices, its the overall attention to detail and the ambiance in the shops. Friendly staff, cool music, relaxed atmosphere, and a general happy vibe really makes it a great experience. Yes, the queue is always big... But you cannot really get annoyed at the shop about that, it is the best sign you can get and it almost draws you in. Broadgate circle has an amazing outdoor seating area with deck chairs overlooking the main circle. I recently went for a late lunch and sat outside with a cold beer and a delicious Poke bowl and watched the world go by with a friend. It was such a nice experience.The lovely shop manager even came up to me and asked politely if I wanted any more wasabi mayonnaise. If you have had this amazing creation you will know what my answer was; "yes please!" Just another example of a friendly atmosphere that is often taken for granted these days. I recommend Island Poke highly to anyone near Kingly Street or Broadgate Circle, its epic! This place always has a massive queue at lunch time so the signs are that it must be good. I have to admit, the food here is really good. Although it can be a bit of a wait to get to the front of the queue, the turnaround time is pretty quick. I would suggest going before 12pm or after 2pm to avoid the crowds. A nice healthy option, which tastes great! Island Poké has been on my list of restaurants to visit ever since I made it a goal to try every eatery in Kingly Court and Carnaby Street. It specialises in poké bowls, a dish that I have grown to really enjoy. They’re perfect for the summer – a healthy and hearty meal with fresh ingredients and beautiful colours! I went for the Yuzu Lomi Lomi. This bowl consists of salmon sashimi in a yuzu dressing, edamame beans, and a yuzu mango salsa. These are topped with fried onions, spring onions, and sesame seeds. When I placed my order, I was given the choice of either sushi rice or salad for the base. I went for sushi rice, as I was quite hungry. As I watched the woman scoop the salmon sashimi into my bowl, I noticed that the portion was quite small. So, I doubled up on the protein, which is an additional £3. On top of the ingredients included in this house bowl, I added some wakame salad (seaweed salad) as a side for an additional price. Overall, I thought this poké bowl tasted good! It was really fresh with the yuzu dressing, as that kept it light and slightly sweet and sour. It looked very aesthetically pleasing with all the colours in the bowl – pink from the salmon, bright yellow from the mango salsa, green from the edamame beans, brown from the fried onions, and a darker green from the wakame salad. I noticed that they were quite generous with the sushi rice in order to fill up the bowl. As mentioned, I had to double up on the protein because there isn’t very much in the original serving. This ended up making the meal more expensive than expected. The eatery itself is quite small and most customers do a takeaway order, especially at lunch with the working crowd dashing in and out to grab a meal. It was nicely decorated to give off beach and island vibes, which is appropriate given its name! However, the music was playing far too loud inside. It was difficult to get my order across to the woman behind the counter and when it came to paying at the end. I’d still recommend trying this place out though, the food really suits the summer weather and vibes. I also noticed that they had a breakfast menu, which is something I will definitely be trying out soon! Lovely spot for a healthy lunch on the go. All fish is fresh and deliciously flavoured so you know you're eating the good stuff. The price is pretty average for an on-the-go lunch, but I love that you can tailor the bowls to your taste. The service is also super fast and friendly. I'd highly recommend a visit if you're a fish lover in the area but I'm not sure it's worth a special visit. Wonderful lunch spot in Central London. If you're looking for a healthy, balanced, quick & tasty meal, this is the best place you can find! 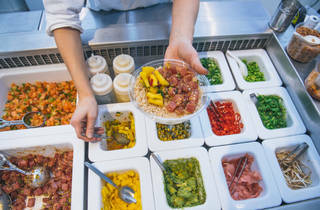 Island Poke offers a variety of delicious toppings and sauces, fish is always super fresh and prices are very reasonable too! My personal choice is always shoyu salmon with sushi rice, kimchi, avocado shallots & sriracha mayo. The perfect little hidden place for a happy lunch! I am obsessed with Island Poke - my new favourite lunch spot hands down! Super healthy, always friendly and great location. 10/10! As a new convert to Poké, I was slightly obsessed with this place when it opened. It's gorgeously fresh, the staff are super lovely and it's not too expensive either. When comparing it to the poké restaurants in Melbourne though, it falls short in terms options and variety. For example, you can only choose from three bases here whereas my favourite poké venue in Melbourne has over 6 incredible bases to choose from along with an insane range of toppings at no extra price. Great little place for lunch if you feel like something fresh and tasty, would definitely recommend this gem. This is such a cute little place for a quick, very fresh poke bowl! I popped in yesterday for my lunch using the MealPal app which I recommend giving a try because it meant I was able to jump the queue and collect my pre-ordered spicy ahi tuna coleslaw bowl which was great as the queue was out the door. The bowl was super delicious - the tuna was gorgeously fresh and the slaw had a great crunch. There were also a few slices of pineapple hidden in there which gave it a lovely sweet kick, alongside the charred corn. The place is small, not really space to eat in (to be honest I didn't even notice if there is seating available) but it has been decorated beautifully, with amazing fish scale blue and green tiling and south pacific murals across the wall. 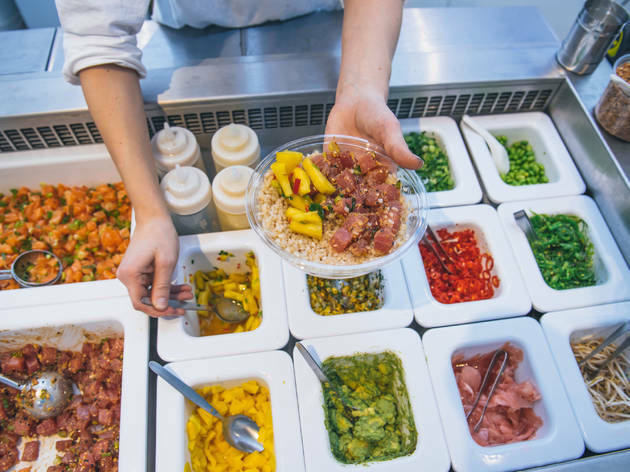 I'd certainly recommend giving this place a go if you enjoy poke bowls - it'll be a great place to grab a fresh, light lunch in the warmer weather. Small new poké place close to Carnaby Street. Quick, friendly service and fresh food. Always a good choice to have a quick lunch here! Decent poke, but don't expect it to be as authentic as the ones in California or Hawaii. They should've told people that they ran out of food on their soft launch days, it's not cool to waste people's time. But hey they were new, I'm sure they'll learn. Is poké (pronounced po-kay not poke) the new ceviche? To me, yes! Don't get me wrong, I love a good ceviche but with the colder weather sinking in, I start to crave more hearty dishes. Hence, these bowls of goodnesses filled with rice, and topped with tuna (or salmon) and with other fresh ingredients to your taste do the job. Thankfully poké is becoming more and more popular and the latest addition to London's poké craze is the Island near Carnaby. It looks incredibly cute from outside with its light blue decoration and they have swings for seats by the window along with a Hawaiian themed decoration. The only thing missing is the sound of the waves in the background. They serve Acai bowls in the morning for breakfast and poké from lunch time on. As with the other poké joints you can either pick one of their signature bowls or get your own mix made. I got the tuna topped with pickled ginger and sesame seeds and avocado and the tuna was deliciously cured and soft and tender. Absolutely love this place and I feel that I will be a regular.